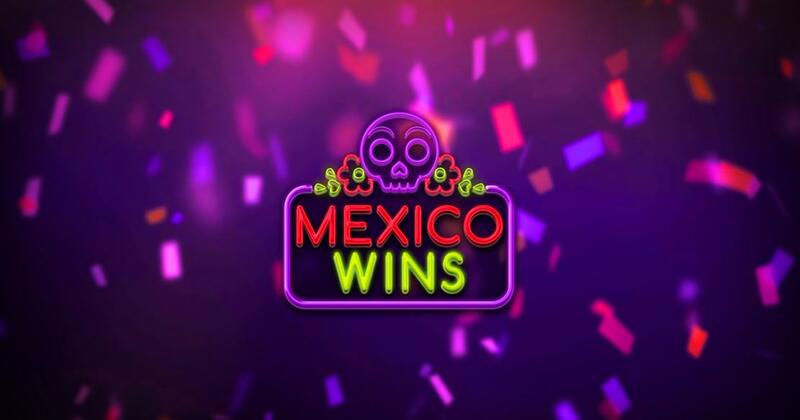 Mexico Wins is a weird mix of Mexican and classic themes, a combination that nobody used before Booming Games. If you’re into Mexican themed games, and you’re interested in playing more of them, this game is certainly part of that category, but it’s quite far from the standard look that these slots tend to have. For one, Mexico Wins has another side to it, connected to the classic symbols that have been in games for over a century. You get the Mexican symbols in the form of Aztec pyramids, pinatas, sombreros, skulls, noise makers, tequila shots or chilis, while the classic side comes from three 7s colored in green, white and red. The design is not quite standard for such a slot either, offering neon style icons on the reels, with a dark backside. A wall of colored dots, or LEDs, seems to be used in the background, beyond the reels. The look is an interesting one, pleasant even though it’s not a standard design for a Mexican themed slot. You play here a game with 30 lines, which will pay both ways, while being arranged on 5 standard-sized reels. Wins of $15,000 are a possibility, with the list of features consisting of wilds, scatters, free spins and 3x multipliers. As you start playing this game, you might decide to take it slowly and invest a smaller amount at first, the wager being as low as $0.30. At the other end of the betting range, you can spend $300 per spin, using $10 line bets. A Pyramid Wild is among the symbols which will prove to be very helpful to you in the long run. It even pays you directly, with a 200x jackpot coming through it if a combo is formed only with wilds. As a substitute, you will find it a useful addition to a line-up of regular symbols, since it will be part of their wins. Next, there is also a Pinata Free Spins scatter, a symbol that is useful to you no matter where it lands. It’s also the more profitable symbol of the game, with its own rewards paying up to $15,000 (50x total stake). 3+ Pinatas will also get you 10 free games. For the duration of the feature, 3x multipliers will triple any wins that you get. Mexico Wins delivers a decent looking theme, sort of unique in its own way, plus a couple of good features, which even include some exciting multipliers.